AirVPN started in Italy in 2010 when a small group of activists concerned about online freedom and privacy rights, got together to work on a project aimed at helping users to access internet without restrictions. Nowadays AirVPN is a VPN solution that looks to offer competitive prices for their customers, but the company is still committed to the ideals that inspired its creation. AirVPN provides a private and secure service that will give people around the world the chance to use internet as a channel to express their opinions, without fear of being censored or prosecuted. AirVPN stands apart from other VPN providers for providing unique features such as transparency of service, VPN over Tor and through SHH and SSL tunnels. To understand better how AirVPN can help to protect your data online, keep on reading as we take a look at what this simple but effective VPN service offers. AirVPN has a clear and simple interface that is supported by advanced technology to keep your anonymity protected. The provider offers a Windows client and a dedicated version for Windows 8. It is also possible to set up the service in Linux, Mac OSX, iOS, Android, as well as in DD-WRT and Tomato routers. AirVPN supports OpenVPN, the most secure and reliable protocol and it is also available over SSH and SSL. This ensures that even if OpenVPN is disrupted in your country or by your ISP, you can still connect safely. You can trust that your data remains protected thanks to the high level of encryption that is on offer: 4096 bit RSA keys size, AES-256-CBC Data Channel and HMAC SHA1 Control Channel. AirVPN users can also set up the VPN service through Tor, meaning that they can reinforce the level of anonymity of their connection. Tor keeps your identity covered as your internet traffic is encrypted every time it is directed through 3 or more anonymous user nodes around the world. When you use AirVPN through Tor, you can enjoy greater security for your connection and flexibility, since you will be able to access websites that usually block Tor connections. Bear in mind that the speed is dramatically decreased when you use this feature. However, if your main concern is to protect your privacy and to remain anonymous online, connecting to AirVPN through Tor is the ideal solution. As previously mentioned, AirVPN also allows users to establish a connection over SSH and SSL tunnels. When you connect through an SSH tunnel, the fact that you are using OpenVPN protocol cannot be detected. This is a great option for those who live in a country that imposes strict control over internet and where OpenVPN may be disrupted. In a similar manner, connecting through an SSH tunnel can protect your OpenVPN connection from disruptions caused by deep-packet inspections by ISPs. When you connect through an SSL or SSH tunnel, it will be impossible to notice that you are using OpenVPN. While performance and speed are affected when you secure your connection with an SSH or SSL tunnel, it could be a useful option for many users. When you are not using Tor or SSH/SSL tunnels, you can expect excellent speed and reliability from AirVPN. VPN services are known for slowing down your regular connection but with AirVPN, the reduction is less than a MB on 10 megabyte broadband connections. AirVPN also supports dynamic Remote Port Forwarding, which is a feature that can be very useful for P2P. Dynamic Remote Port Forwarding improves P2P performance and can avoid restrictions placed by ISPs, making it an ideal option for older P2P torrent clients such as eMule and Soulseek, which are unable to punch through NAT. 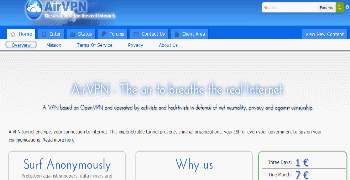 In terms of reliability AirVPN is recognized for offering a solid service that is rarely affected by server downtime. Even when maintenance is required, you can expect the servers to go back online without delay. Another feature that shows the great service that AirVPN stands for is the fact that they give users access to detailed servers statistics. The website provides real-time reports on the status of the servers and users can also keep track of their connection data including IP, download and upload speed. Furthermore, AirVPN offers unlimited traffic for their customers, ensuring that you can enjoy all the content that you want. AirVPN keeps thing simple with a Premium Plan, whose price varies according to the length of your subscription. The prices start at €1 for one day trial and go up to €54 for a full year of service. You can also pay for one month (€7), three (€15) and six months, which cost €30. The Premium plan offers access to all the servers and you can pay with Bitcoin for additional anonymity. The prices may be higher than other VPN option but you get a great service for your money. Since AirVPN started as a project that focused on looking for a secure solution for activists to fight repression over internet, the fact that they do not keep logs of your online activity is not a surprise. AirVPN display a high level of commitment to maintaining the security and the anonymity of their customers, while offering top technology in every aspect of their service. AirVPN has servers across the world, which gives you the possibility of enjoying a versatile internet surfing experience. United States, Canada, Germany, Spain, France, UK, Netherlands, Romania, Singapore, Switzerland, Ukraine, Portugal, Luxembourg, Hong Kong and Sweden are the countries supported. Users can easily connect to a server near them to enjoy an stable speed or connect to a server that allows them to watch content that is generally not available in their area. The website offers a great deal of helpful information that will guide you through the configuration process, as well as providing solutions to most common issues you may come across while using a VPN. There is a forum where you will find useful tips, step by step guides and a FAQ section. Additionally, you can contact the customer support team using the webform email ticket system. Being a small company, AirVPN does not offer live chat support, but you can expect a reply within a few hours. The support team is always willing to help and they provide a very efficient service. AirVPN is a complete and convenient VPN solution. It will enhance your internet experience by offering protection and freedom to enjoy content even if it is restricted in your location. The speed of the service, combined with a knowledgeable support team and a high level of security make AirVPN an excellent choice. The fact that users get a detailed overview of the servers usage, the versatile features and the transparency about the service are other aspects that put AirVPN ahead from many competitors.